Nebraska is home to over 275 different species of insects and the most common insect that Nebraska home owners will come into contact with is the house ant. Ants are the most common household insect in the United States and invade more homes every year than any other pest. Ants are extremely successful at gaining access to homes by finding and crawling through the smallest crack or crevice that is on your home. Ants are excellent scavengers and travel in large numbers, making the possibility of an ant infestation within the walls of your home very high. One of the most common ants found in Nebraska is the black carpenter ant. Black carpenter ants are known mostly for their size as they grow to be twice the size of most other ant species and can grow up to a half inch in length. Carpenter ants typically nest in wood and are associated with moisture issues. They are usually found in structures where water has leaked or a pipe has broken. These areas include but are not limited to wood that has been soaked through, under windows, around plumbing, or where the roof has leaked. 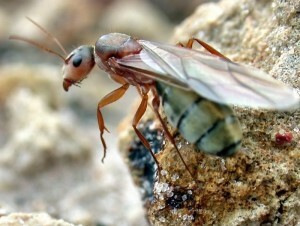 Once carpenter ants find a reliable water source, they are difficult to get rid of. What do Black Carpenter Ants Eat & What Damage Can they do? Most people believe that carpenter ants eat wood, but this is not true. Carpenter ants do not eat wood. The diet of a carpenter ant usually consists of living and dead insects, honey dew form aphids, sweet meats and fats. The reason why carpenter ants are generally mistaken for being wood eaters is that they use their very strong ant jaws to tunnel through wood, which results in saw dust or fine wood shavings being left behind. Carpenter ants in Nebraska are excellent scavengers and can create extremely intricate tunneling systems for their colony to survive and thrive in. While you may see a carpenter ants crawling around every once in a while during the day, they are actually most active during the night time. Carpenter ant colonies emerge after dusk and then return back to their nest prior to dawn. Carpenter ants also make a noise that has been compared to the sound of crinkling cellophane as they move about in their colony. Some homeowners have used a stethoscope to identify where the nest of carpenter ants are hiding within the walls of their home. If you suspect that your home may have a carpenter ant problem, contact Romar Pest Control today, our technicians are skilled and experienced at eliminating the presence of ants from your home.